Ever since moving to Nottingham I have fallen in love with their array of vintage/antique shops, and independent boutiques. Cow vintage was a brand that I have been aware of for over a year, so when I saw that they had a store in Notts I couldn't believe my luck. As vintage shopping goes, this is one of those shops that makes browsing (and rummaging) through vintage an ease as everything is extremely well laid out and organised. Also with such a vast collection of both decades and styles it has become my one-stop destination to loose myself in and escape from the hustle and bustle of everyday life. 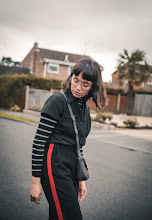 Owning a pair of vintage Levi jeans have been top of my list for far too long to recall, but like with any piece of clothing I have a somewhat strict 'criteria' that they have to fall into. This 'criteria' included being of the high-waisted/mom jean style, dark wash and under £30. Some may say that this is 'a lot' to ask for a pair of good quality jeans, but I was determined to achieve it. Remarkably I did indeed fulfil it, with this very pair of jeans costing me just £18...I still can't quite believe my luck. If you are in Nottingham or fancy yourself as more of an online shopper than be sure to check out WE ARE COW, as you never know what bargains you might lay your hands on. P.S You can now view this look on LOOKASTIC here!